It’s the last few weeks of tomato season here. You know what’s also about to end? The mushroom invasion of our back yard. We have this big, shaded back yard, and we picked this house hoping Thunder would run around and, you know, potty-train herself out there with little input from us. Fail. The back yard, it turns out, grows mushrooms. On a dynastic level. We discovered this a few weeks ago, after Scott went to work and I took my coffee and the dog out there. I did what I was instructed to do by the dog trainer lady, which is psyche Thunder up by yelling “poop! yay!” in an encouraging tone of voice for about 20 minutes. This totally weirds the dog out and will eventually complicate our nice neighbors’ attempt to potty-train their child. My next thought was they could be poisonous. So I called poison control of Alabama, which, it turns out, is a bunch of super bored, poison-savvy guys who actually live in Virginia and will talk to you about mushrooms until forever. But they did offer to analyze my mushroom samples, which is awesome because I am really looking forward to the look on the FedEx lady’s face when I check “refrigerate” and why yes, this box does contain both agricultural products and possibly noxious chemical substances. In the end I called Scott and said “the vet says you need to come home and drive Thunder around in your car until she pukes,” which was partly true and went over really well. When Scott started talking to me again a few days later, he brought home the National Audubon Society Field Guide to Mushrooms. I think he did this as a joke, which is typical because I don’t see any boy scout merit badges for wilderness survival around here, do I now, Scott? But based on pages 525-545, I have decided that our eight (eight?!) varies of mushroom are all poisonous and need to be killed before they kill us. That is, as soon as I figure out whether we need some kind of E.P.A. permit to buy several hundred gallons of industrial-strength bleach, and how close our back yard is to any sort of stream. In the meantime, I am considering calling the local boy scouts and offering them the use of our back yard for training purposes. Suffice it to say, I am boycotting mushroom recipes for now because they just stress me out. Instead, I made this really great pasta sauce the other day as an homage to fresh, local tomatoes, which are totally safe and will be gone pretty soon. Red peppers are still available, so I puréed some of those, too. It would probably be just as good without peppers, though, if you added a few more tomatoes. Also, this is the first time I have added red wine into the mix, so I know that you don’t need it to have a good sauce. Like any great tomato sauce, this one should simmer for a couple of hours. It’s the kind of thing you want to make on a day you don’t mind popping into the kitchen every now and then. In the meantime, cut the 2 red peppers into quarters and remove the seeds. Place red peppers in a glug (2-3 tbsp.) of olive oil in the pot you will be using for the tomato sauce. Sautée the red peppers over medium heat until the flesh has softened and the skins are brown and crinkley, about 30 minutes. Remove red peppers from the pot and place on a cutting board. 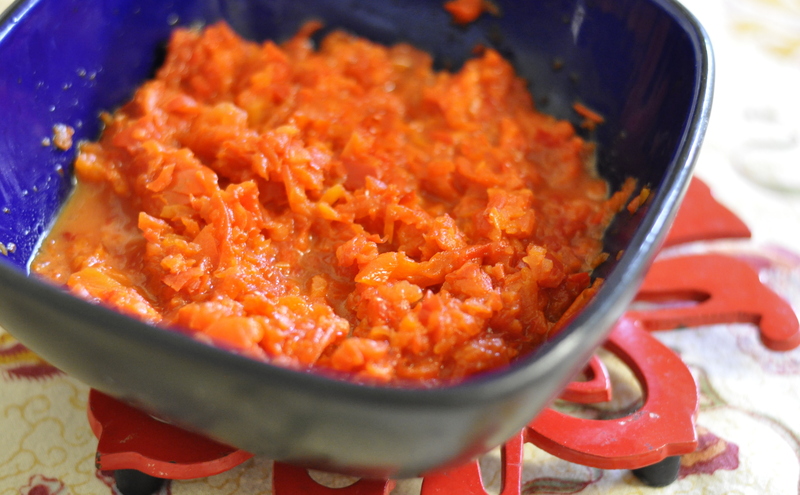 Purée the skinned red peppers in a food processor. Return red pepper purée to the pot with the garlic. Simmer over low heat while you skin the tomatoes. To do this, reduce the heat on the pot of boiling water, jab a fork into the top of a tomato and submerge it in the hot water for about 30 seconds. On the cutting board, pierce the skin of the tomato slightly with the fork or a knife, and you should be able to peel the skin off with your fingers. Dice the skinned tomatoes and add them to the pot with the garlic and red pepper puree. Season with salt and pepper. Add the can of tomato paste, two cans-worth of water, the 1/8 c. red wine, and the 1/2 tbsp. brown sugar. Stir until ingredients are mixed. Simmer the sauce over low heat (I used 3 or 4 out of 10 on an electric stove top) with the lid partly on for at least an hour, stirring occasionally. We cooked ours for at least two hours. The sauce will thicken and become richer the longer you cook it. If it gets too thick (i.e., you can see big bubbles building up in the sauce before they pop loudly at the surface), add water. If you add too much water by accident, don’t worry about it: If the lid is partly off, the water will evaporate and the sauce will thicken again. About 20 minutes before you want to serve the pasta, throw the basil (whole or ripped into two pieces) into the pot. 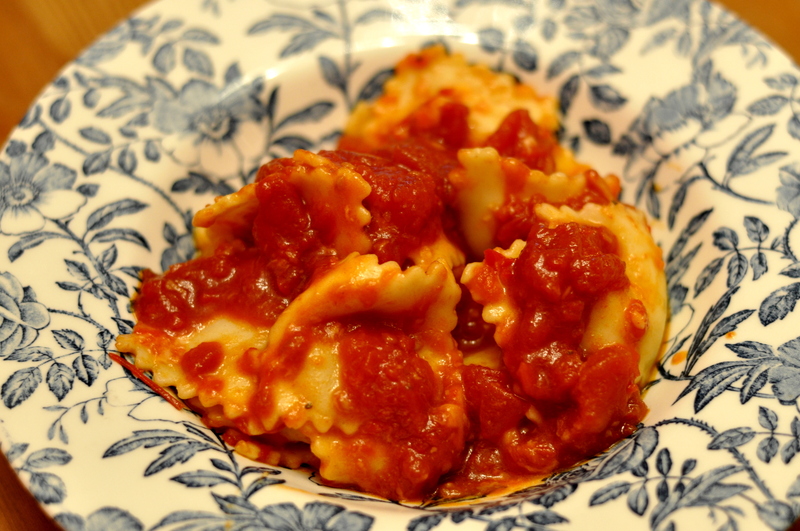 Serve the sauce over whatever pasta you like, with parmesan or ricotta to taste. Note: After I drain pasta, I put it in the serving bowl with a bit of parmesan. The parmesan melts onto the pasta and creates textures that the sauce can “grab on to”– kind of the way certain lettuces, like frisée, hold salad dressing better. Then I spoon the sauce over the pasta. Tossing with parmesan before adding the sauce is especially helpful in binding the sauce to thin pastas that sauce can just slip off of, like angel hair, spaghetti, and fettuccine. Not sure about you, but I definitely need some red wine for my sauce. Bahahaha! 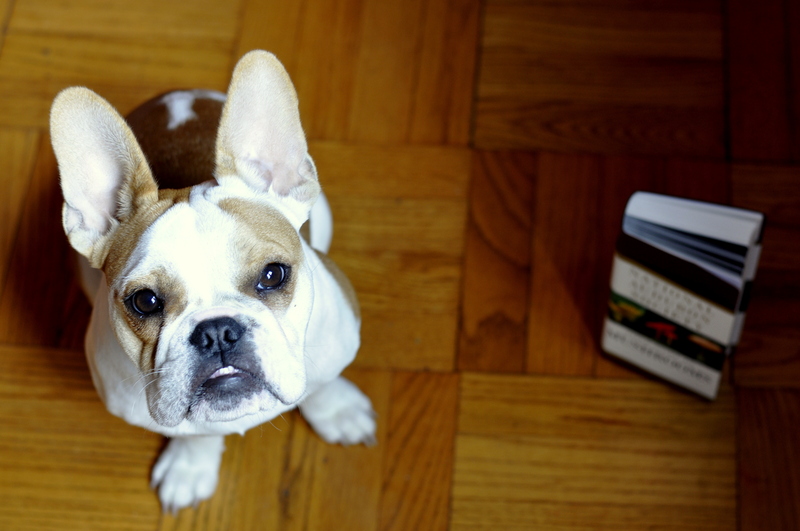 wait you have a french bulldog?? Hey there! I got her in April after my mom located her in Virginia. She’s actually a cross between a French and English (mom was English). She’s 25 lbs and 7 months old. The mix factor is awesome– she’s super athletic. She is a total alpha at the dog park and likes enormous dogs– like French Mastiff enormous. My life is at least 30% funnier since I got her. How’s your little one? 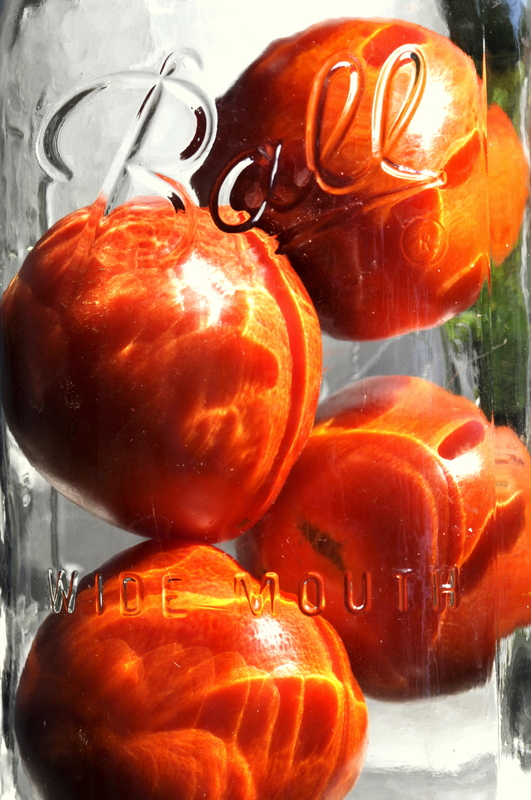 I LOVE the photo of the tomatoes in the Ball jar! It would be gorgeous blown up big and framed. In any kitchen.